Our tent was almost crushed by snow and wind. It took all our strength and effort just to keep the walls from collapsing. If you have been following the expedition since our departure from Churchill, you'll know we have had a fairly windy journey with some unscheduled "storm" days. However, we still seem to have been making good progress. Then... the blizzard came. The day after we left Arviat (last Thursday) was beautiful! Blue sky, sunshine, and a slight breeze from the south. Paul called the Weather Institute before our departure from Arviat to check the forecast. They were predicting sunny skies with mild 15-20 km winds from the south for the next three days, and possibly, some pretty cold days over the weekend. Nothing too serious. Obviously, we don't usually know the weather forecast..and that's actually a good thing. Therefore, we need to look and listen carefully to all subtle signs that nature provides. Cloud types, the movement of animals, and wind are all important weather forcasting clues. We always expect wind from the south and southeast to be followed by winds from northwest (remember the Inuit sayings... see trail report 2/21). Basically, we are constantly watching and ready for a big storm. This is for two main reasons. First, it keeps us safe. Being prepared and always alert for a big storm could mean the difference between life and death. Second, we will know exactly what to do when a big storm hits. Thursday night we placed our tent facing the oncoming southern wind. We always place the tent carefully so that it creates the least wind resistence. If the tent were not in line with the wind, a large gust could easily tear the tent apart and even break poles rather than traveling up, over, and around it. That night, we were putting the finishing touches on our report for Friday, and at about ten o'clock, we were all ready to send. Suddenly, our mail was mysteriously gone!?! We are still not exactly sure what happened, but it may have something to do with our shifting of power supplies. Even that seems unlikely as we had tested this procedure before leaving on the expedition. We were very disappointed, but had to stop in order to finish our chores for the night. We would also need to get up early to rewrite the whole thing and send it before we could start mushing for the day. The next morning when we were ready - AGAIN! Paul went out to adjust the antenna. He came back into the tent, reporting that it was getting pretty windy but it was still beautifully sunny. For some weird reason, though, we could not get a good connection with our satellite communication system. As a matter of fact, we have never seen the connection levels so low. It’s simple really. We need 3 to 4 bars on a scale of 5 (or 56-59 kbs) to be able to send a report. This relates to the quality of our connection with a satellite which is circling the earth around the equator. Today, we were only reading 1 bar or 32 kbs. Something was very, very weird. We checked all of the connections, the power source... everything. The whole system looked fine, no problems. We scratched our heads. Our sleds and gear were burried after the storm. Paul went outside again. This time, he quickly came back in saying that the wind was knocking the antenna over. If this kept up it would be impossible to send a message, let alone travel. We debated and we pulled out the maps. We were camped almost 3 miles from land on the sea ice - a dangerous place to be in a severe storm. Initially, we were following a local route to a specific point ten miles ahead. Having to camp out here in a storm is sketchy at best. Ice can easily break loose - especially when strong winds from land (west, northwest) to the sea. 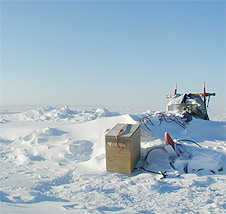 During these conditions, the ice "blows out" leaving open water between you and land. This rarely happens, but it is an important consideration because anything is possible out on the ice. Within ten minutes, the decision to move camp was no longer ours to make. The winds were extremely strong and blowing at storm force. An hour later, we were in the middle of a full blown blizzard with constant winds of 80 km/hour and gusts up and over a 100 km/hour (45 - 60 miles )... from the northwest! Our tent was facing the worst direction possible. The side of it was getting blasted. The poles bent in crazy directions and the inside of the tent assumed a very awkward shape. We hoped that the thin material and poles would hold. We hadn't anticipated THIS! Nobody had, not even the weather station. Actually, our new friend Tony mentioned one thing to us as we mushed out of Arviat. He noticed the surface snow and said snow that looks like this usually means a big storm is on its way. We laughed a little, saying, "yeah, yeah, we heard about some wind from the south." We reflected on Tony's insight and intuition as we waited patiently for the storm to let up. We had to shift ourselves in the tent since it was impossible to sit on one whole side. We wanted to get outside and reposition the tent but the wind only blew stronger. In the early afternoon, Mille went out to shovel snow away from the side of the tent. It was impossible to stand up straight. The wind was so strong it literally knocked her over. She could still see both the dogs and the sleds about 50 feet away. Facing land and looking into the wind, however, visiblity was only 2 or 3 feet. She started shovelling a protective snow wall while Paul stayed in the tent monitoring the stoves and equipment. Our theory is to have one person warm and safe inside the tent in case the other person needs help. A few hours later it was Paul's turn to shovel snow. Once outside, Paul couldn't see. Everything was white. He couldn't even see the nearest sled which was only 5 feet away. The tent was being buried in snow, too! The vestibules were filling up and at one point the opposite wall inside the tent was a foot from Mille's face, crushed from the weight of the snow and wind. Paul fought a brave fight trying to stake the tent with skis and guy lines. Then, we waited and waited and waited. We laid in our bivy bags trying to support the poles with our feet, dressed and ready to jump outside in a moments notice. Of course, we were still thinking, "if we could just turn the tent." It was risky, at best, trying to change anything around. Every 3 hours we went outside to shovel. It took us an hour to dig out each time. The walls were still being pushed in from the snow. We stacked our bags up to give more support. It was, without doubt, a loosing battle. We kept the lantern on all night and the stove on for a heat source when coming back inside from our most recent snow battle. It was very, very scary. The worst thing is the waiting. It is hard to keep your mind on what is going on and what can happen. You just look at the yellow tent walls. The wind is screaming, its hard to talk, and we have to yell in order to hear each other. Earlier in the day, Mille found a book with Inuit legends and was reading out loud which made the time pass a little more quickly. At night, when the dark sets in we count hours, minutes, and even seconds. The darkness definitely makes our situation worse, because everything is so much more difficult. We made plans for the "what if's," that might happen throughout the night and had decided that, no matter the strength of the blizzard, once the daylight returned we had no choice but to attempt moving the tent or setting up our spare tent. It was a matter of time before these poles snapped. Not able to rest, Mille sang Danish songs from her childhood. Out of nowhere, she was able to remember the lyrics. It is amazing how certain things suddenly come back...songs not heard for years and years. For some reason, it was very calming thinking of family and childhood things. It provided insight into the Inuit practice of singing and telling stories during the long dark nights. In the morning, the drifting was happening at a mind-boggling rate. It was hard to keep the tent doors open. We ate a hearty breakfast with extra butter to have lots of energy to keep us warm. Worst case scenario, we would pack up and prepare for "operation move." We have to make jokes to keep our spirits high. As Mille's favorite song goes, "Always Look on the Bright Side of Life." Heading outside, we hoped this philosophy would work. It took more than two hours to move the tent, followed by a couple of hours spent digging out the dogs, feeding them, and making sure all were in good spirits. Sweet success. By late afternoon, we were back in the tent, now facing the correct direction, and much happier. Safe and sound. We made the right decision and it felt good. Late that night, the storm faded and the temperature dropped. The next day was beautiful - though it took us almost 3 hours of digging to get the sleds out. The blizzard was over and we made it in one piece. The worst thing that happened was a small tear in the tent snowflap from a shovel when digging in the dark. We were both ready to sing with joy! Personal songs could also be given to another person. A song owner might give his or her song to show appreciation for some help or to somebody who bears the same name. The same goes with names by the way. If somebody has done something very valuable, the Inuit family who received the help traditionally name a child after the person. Tony from Arviat, who helped us out a lot while we stayed there, was named after the elder who led the drum dance which was done to honor us during our stay. Tony, the lead drummer, had saved our friend Tony's older brother from freezing to death once when he was lost on the tundra! 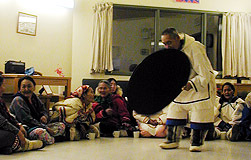 Drum dancing is the most popular form of traditional Inuit music. It used to be played at every gathering, whether it be birth, marriage, the changing of seasons, a successful hunt, a blizzard, a greeting for visitors, or to honor someone who had died. Today, unfortunately drum dancing has become pretty rare in many communities. A large reason for this was the fact that the Inuktitut language was not allowed to be taught in the school system. Inuit songs slowly disappeared. With the creation of Nunavut and Inuktitut again being the official language, there might be a brighter future for drumdancing. We truly hope so. It is a very powerful and inspiring experience to be part of a dance. Our host, Peter, performs a drum dance. The Singers - usually women - sit in a circle. The huge drum is about 3 feet in diameter with a large handle. A drumstick is thrown in the middle by the lead drummer. This is an invitation for any drum dancer to come up and begin. If nobody volunteers to start, the women will sit and chat, joking back and forth about the men there until they start singing, usually a personal song of a man who is present, who is then obligated to dance. The drum dancer then grasps the drum and starts a beat while dancing around in the circle, sometimes even singing or talking along. Except for a tea break now and then, this often goes on for hours and hours well into the night. Kids also get to try both the drumming and the singing. Women can also be drum dancers by the way. Throat singing is mainly reserved for women. It is usually performed by two women standing or sitting face to face, one must often be a little bit higher than the other. Each singer repeats a different sound in a fast rhythm. The sounds gets resonance from the other person's mouth making a really interesting sound. To get an idea of how it works try this: make a sound deep in your throat without making any noise from your mouth. Make the sound long or short as you exhale, then inhale very quickly without making a sound. Repeat this (remember to make the sound only as you exhale) for a while - to get the resonance you can try using a large bowl or kettle near your mouth. Throat singing can go on for a really long time and there is often a contest to see who can continue the longest. The low pitched sound that is the trademark of throat singing represents sounds made by different animals and birds. Late Monday night we arrived in Whale Cove. Here the preferred art form is sewing - mostly clothing in all sorts of fancy fashions as well as wall hangings. After being met by a welcoming commitee on the ice, led by the mayor of town, Stanley and followed by a ton of very helpful kids, we were invited to stay at the local Hotel "Inns North" for the night. The dining room here is filled with beautiful wall hangings that we admired as we feasted on good food. We learned a lot about this little community of roughly 300 people. As we were mushing in yesterday, we could see what looked like little islands in the sky. We were not sure whether we were seeing a mirage or if we were actually seeing some piece of land with a different elevation from the flat tundra we have experienced since leaving Churchill. Looking at the map, though, we noticed a slight 50 foot rise. Following a long pointed piece of land, we could finally see Whale Cove. Whale cove is perched on a piece of rugged land, surrounded by rolling hills, and nestled in a cove here on Hudson Bay. The Inuktitut community name is Tikirarjuaq which means "long point." The people here are very closely connected with nature and still follow the rhythms of the seasons. If we were to arrive in a few months, in spring at the end of May, there would not be many people in town because most of the Inuit move out onto the land in a big community camp, fishing for Arctic Char and Lake Trout, while hunting geese and gathering eggs. In late June or July, when the ice in Hudson Bay breaks up, the boats go out to catch seals and walrus. By late August, the harvest of the beluga whale begins. Beluga whales are one of the three true Arctic whales (belugas, narwhales, and bowheads). Of the three, belugas are the most numerous and widely distributed with between 60,000 and 100,000 living in arctic and subarctic waters. Every summer, they gather in large numbers in the shallow waters to give birth and to shed their skin. They are 4-5 meters (12-16 feet) in length and are snow white and especially known for being exceptionally vocal. They make chirping, trilling, and clicking noises to each other which have given them the nick name the "sea canaries." The meat is eaten frozen and the blubber is a very important source of fat. One common way to prepare the meat is to hang it and let it "drip" oil which is aged and served as a dip for frozen caribou meat (Mille loves this). The main stay of the diet here is "maktaak" which is the outer layer of the skin of the whale served cooked or raw. Now, try and figure why the name of the town is Whale Cove, eh! We have had a lot of fun here since we arrived. Today, we were invited to the Inuglak School and the yearly "Science Fair." The students worked in pairs and picked a topic that they would like to study further. They then studied their topic in detail, designed an experiment, and finally made some awesome exhibits explaining their experiment, the results, and most importantly, what they learned. There was everything from "What We Wear" on which kind of fur would be the best insulator (result was polar bear coat), to live beatles, snails, and meal worms imported from the south, cleaning water samples to study their impact on "Dirty Water" to "manufactured" volcanoes. (That was one of Mille's favorites.) Paul especially liked one studying "rockets." The winner of the Fair was the "What We Wear" display. It was excellent! The winners will be going to Baker Lake with a teacher at the end of the month. Who knows, we might see them there! This school definitely has some incredibly talented students. A group of 15 students from different grades presented us with a book that they autographed and gave us as a gift. The reason it was so special was the fact that the students had written and illustrated it themselves!!! It is called, "The Lonely Inukshuk" and is published by Scholastic Books. They entered it into the "Create-a-Book" competition and WON IT! Besides from having their awesome book printed, they also won $1,000 for the school. Simply incredible. Tonight, we are supposed to visit with an elder in town who is known here in the region for being one of the best mushers. Our plan was originally to leave this afternoon, as we would like to try to get to our next stop which is Rankin Inlet before the weekend. But, first of all, the people here in Whale Cove are so nice that it’s hard to leave. Secondly, Eve the hostess here at the "Inns North," told us that her bones are hurting so we better check on the weather. Sure enough, another storm - this time only "near blizzard" conditions - is supposed to be here tomorrow. So, we will wait to make any decisions until tomorrow morning on whether we are heading out or not! For all we know, the weather forecast could most certainly be wrong. But, it could also be right! So, we might still be here in Whale Cove when we are going to "talk" with some of you on the planned Sametime Chat in the "My Arctic Engine" Collaboration Zone on Thursday! The authors of the book, The Lonely Inukshuk.